An extensive new survey by the Pew Forum on Religion & Public Life details the religious affiliation of the American public and explores the shifts taking place in the U.S. religious landscape. Based on interviews with more than 35,000 Americans age 18 and older, the U.S. Religious Landscape Survey finds that religious affiliation in the U.S. is both very diverse and extremely fluid. More than one-quarter of American adults (28%) have left the faith in which they were raised in favor of another religion – or no religion at all. If change in affiliation from one type of Protestantism to another is included, roughly 44% of adults have either switched religious affiliation, moved from being unaffiliated with any religion to being affiliated with a particular faith, or dropped any connection to a specific religious tradition altogether. The Landscape Survey confirms that the United States is on the verge of becoming a minority Protestant country; the number of Americans who report that they are members of Protestant denominations now stands at barely 51%. Moreover, the Protestant population is characterized by significant internal diversity and fragmentation, encompassing hundreds of different denominations loosely grouped around three fairly distinct religious traditions – evangelical Protestant churches (26.3% of the overall adult population), mainline Protestant churches (18.1%) and historically black Protestant churches (6.9%). While those Americans who are unaffiliated with any particular religion have seen the greatest growth in numbers as a result of changes in affiliation, Catholicism has experienced the greatest net losses as a result of affiliation changes. While nearly one-in-three Americans (31%) were raised in the Catholic faith, today fewer than one-in-four (24%) describe themselves as Catholic. These losses would have been even more pronounced were it not for the offsetting impact of immigration. The Landscape Survey finds that among the foreign-born adult population, Catholics outnumber Protestants by nearly a two-to-one margin (46% Catholic vs. 24% Protestant); among nativeborn Americans, on the other hand, Protestants outnumber Catholics by an even larger margin (55% Protestant vs. 21% Catholic). Immigrants are also disproportionately represented among several world religions in the U.S., including Islam, Hinduism and Buddhism. Although there are about half as many Catholics in the U.S. as Protestants, the number of Catholics nearly rivals the number of members of evangelical Protestant churches and far exceeds the number of members of both mainline Protestant churches and historically black Protestant churches. The U.S. also includes a significant number of members of the third major branch of global Christianity – Orthodoxy – whose adherents now account for 0.6% of the U.S. adult population. American Christianity also includes sizeable numbers of Mormons (1.7% of the adult population), Jehovah’s Witnesses (0.7%) and other Christian groups (0.3%). Like the other major groups, people who are unaffiliated with any particular religion (16.1%) also exhibit remarkable internal diversity. Although one-quarter of this group consists of those who describe themselves as either atheist or agnostic (1.6% and 2.4% of the adult population overall, respectively), the majority of the unaffiliated population (12.1% of the adult population overall) is made up of people who simply describe their religion as “nothing in particular.” This group, in turn, is fairly evenly divided between the “secular unaffiliated,” that is, those who say that religion is not important in their lives (6.3% of the adult population), and the “religious unaffiliated,” that is, those who say that religion is either somewhat important or very important in their lives (5.8% of the overall adult population). Even smaller religions in the U.S. reflect considerable internal diversity. For instance, most Jews (1.7% of the overall adult population) identify with one of three major groups: Reform, Conservative or Orthodox Judaism. Similarly, more than half of Buddhists (0.7% of the overall adult population) belong to one of three major groups within Buddhism: Zen, Theravada or Tibetan Buddhism. Muslims (0.6% of the overall adult population) divide primarily into two major groups: Sunni and Shia. The survey finds that constant movement characterizes the American religious marketplace, as every major religious group is simultaneously gaining and losing adherents. Those that are growing as a result of religious change are simply gaining new members at a faster rate than they are losing members. Conversely, those that are declining in number because of religious change simply are not attracting enough new members to offset the number of adherents who are leaving those particular faiths. To illustrate this point, one need only look at the biggest gainer in this religious competition – the unaffiliated group. People moving into the unaffiliated category outnumber those moving out of the unaffiliated group by more than a three-to-one margin. At the same time, however, a substantial number of people (nearly 4% of the overall adult population) say that as children they were unaffiliated with any particular religion but have since come to identify with a religious group. This means that more than half of people who were unaffiliated with any particular religion as a child now say that they are associated with a religious group. In short, the Landscape Survey shows that the unaffiliated population has grown despite having one of the lowest retention rates of all “religious” groups. Another example of the dynamism of the American religious scene is the experience of the Catholic Church. Other surveys – such as the General Social Surveys, conducted by the National Opinion Research Center at the University of Chicago since 1972 – find that the Catholic share of the U.S. adult population has held fairly steady in recent decades, at around 25%. What this apparent stability obscures, however, is the large number of people who have left the Catholic Church. Approximately one-third of the survey respondents who say they were raised Catholic no longer describe themselves as Catholic. This means that roughly 10% of all Americans are former Catholics. These losses, however, have been partly offset by the number of people who have changed their affiliation to Catholicism (2.6% of the adult population) but more importantly by the disproportionately high number of Catholics among immigrants to the U.S. The result is that the overall percentage of the population that identifies as Catholic has remained fairly stable. In addition to detailing the current religious makeup of the U.S. and describing the dynamic changes in religious affiliation, the findings from the Landscape Survey also provide important clues about the future direction of religious affiliation in the U.S. By detailing the age distribution of different religious groups, for instance, the survey findings show that more than six-in-ten Americans age 70 and older (62%) are Protestant but that this number is only about four-in-ten (43%) among Americans ages 18-29. Conversely, young adults ages 18-29 are much more likely than those age 70 and older to say that they are not affiliated with any particular religion (25% vs. 8%). If these generational patterns persist, recent declines in the number of Protestants and growth in the size of the unaffiliated population may continue. Major changes in the makeup of American Catholicism also loom on the horizon. Latinos, who already account for roughly one-in-three adult Catholics overall, may account for an even larger share of U.S. Catholics in the future. For while Latinos represent roughly one-in-eight U.S. Catholics age 70 and older (12%), they account for nearly half of all Catholics ages 18-29 (45%). Finally, the Landscape Survey documents how immigration is adding even more diversity to the American religious quilt. For example, Muslims, roughly two-thirds of whom are immigrants, now account for roughly 0.6% of the U.S. adult population; and Hindus, more than eight-in-ten of whom are foreign born, now account for approximately 0.4% of the population. Mormon adults and 15% of Muslim adults in the U.S. have three or more children living at home. Protestant churches. The Northeast has the greatest concentration of Catholics, and the West has the largest proportion of unaffiliated people, including the largest proportion of atheists and agnostics. unaffiliated, three-in-four belong to the “religious unaffiliated” category (that is, they say that religion is either somewhat or very important in their lives), compared with slightly more than one-third of the unaffiliated population overall. population overall. Hindus and Jews are also much more likely than other groups to report high income levels. People not affiliated with any particular religion and Muslims stand out for their relative youth compared with other religious traditions. About three-in-ten (31% and 29%, respectively) are under age 30 and more than seven-in-ten (71% and 77%, respectively) are under age 50. Comparable numbers for the overall adult population are 20% under age 30 and 59% under age 50. By contrast, members of mainline Protestant churches and Jews are older, on average, than members of other groups. Roughly half of Jews and members of mainline churches are age 50 and older, compared with approximately four-in-ten American adults overall. describe their race as Asian, while nearly three-in-four Buddhists say they are converts to Buddhism. Jehovah’s Witnesses have the lowest retention rate of any religious tradition. Only 37% of all those who say they were raised as Jehovah’s Witnesses still identify themselves as Jehovah’s Witnesses. Members of Baptist churches account for one-third of all Protestants and close to one-fifth of the total U.S. adult population. Baptists also account for nearly two-thirds of members of historically black Protestant churches. These are some of the key findings of the Pew Forum’s U.S. 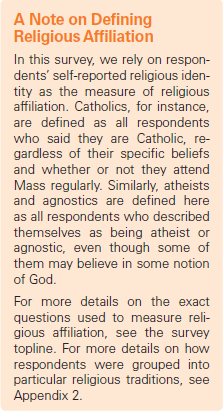 Religious Landscape Survey, which draws primarily on a new nationwide survey conducted from May 8 to Aug. 13, 2007, among a representative sample of more than 35,000 adults in the U.S., with additional oversamples of Eastern Orthodox Christians, Buddhists and Hindus. The study also takes advantage of the 2007 survey of American Muslims (“Muslim Americans: Middle Class and Mostly Mainstream”), which was conducted by the Forum in partnership with its sister projects, the Pew Research Center for the People & the Press, the Pew Hispanic Center and the Pew Global Attitudes Project. In total, these surveys included interviews with more than 36,000 Americans. Detailed tables, published as Appendix 1 (PDF), provide extensive demographic information on the 14 largest religious traditions, 12 large Protestant denominational families and 25 individual Protestant denominations in the United States.